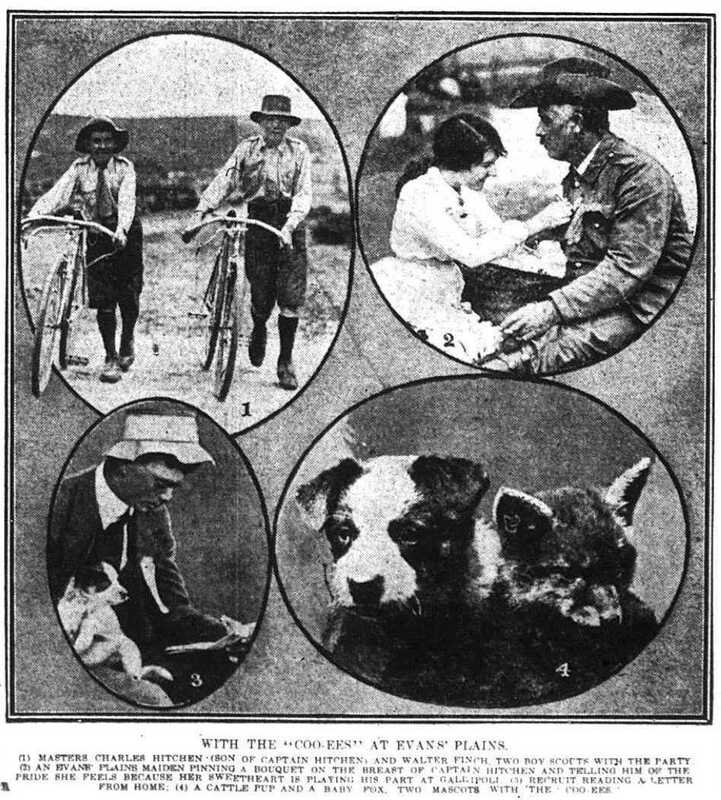 Transcription of an article titled ‘The Great Route March : the tremendous Bathurst welcome’ from The Farmer and Settler, 2 November, 1915, p. 3, [part 3 of 3]. The track from Yetholme to Wallerawang was mostly down hill, by the route, we took on Saturday, via Meadow Flat and Thompson’s Creek. Sunny Corner again co-operated, this time with Meadow Flat, to provide luncheon for the recruits, the meal being laid out on the grass by tho school house. Bouquets and cigarettes were supplied to each man, and after an excellent “lunch,” which might well have been called a dinner, the remainder of the nineteen miles was tackled to “‘Wang,” as the local people prefer to call the junction town of Wallerawang. Three miles from the day’s destination the school children at Thompson’s Creek presented bouquets to the “Coo-ees,” and a little further on, at the cross roads the entire population of Portland assembles to greet the boys from the west. Mr. Carmichael, M.L.A., who had arrived by the mid-day mail, was also there having travelled out in the Portland coach, together with a large number of Wallerawang townspeople. Speeches were made, and by request of the officers they were made short, as the men are finding “spruiking” the most tiresome part of the march. The Portland Town Band then took the lead, and the journey was resumed to Wallerawang, which town was entered about five o’clock. Camp was pitched at once in the school grounds, and preparations made to attack the dinner that had been prepared by the good ladies, assisted by a contingent of enthusiasts from Portland. Another matter in which official intervention has been found necessary was that of smoking materials. All along the route tobacco and cigarettes have been provided, generously, usually handed out at meal times by the ladies. As a number or the boys have colds hanging to them still, medical advice was sought, and they were told that the colds would never be shaken off while they continued to smoke such excessive quantities of cigarettes. Therefore only a limited quantity is now allowed, and any surplus is taken charge of by the quartermaster-sergeant and changed by obliging store-keepers for pipes and tobacco.